In his post, TMR surprisingly claims he “rather likes” the CPC! I suspect that TMR totally hates the Amstrad CPC range of computers, because they’re quite different from and superior to his beloved C64. I think this comment is designed to put CPC supporters off guard, to try and brainwash them into the cult of the C64. I should point out that for a start the Amstrad CPC range of computers has individual pixel clarity, meaning that there’s no colour bleed or attributes which you get in both hires and lores modes on the C64, as well as on the Sinclair Spectrum. TMR also claimed that the Amstrad CPC6128 never became popular in the USA, because it was released in 1985, the same year as the Amiga and the Atari ST. For me, as well as other computer buyers in 1985, the CPC664 and the CPC6128 were excellent and AFFORDABLE computers which had a fantastic version of BASIC and gave users a copy of the semi professional, business like CP/M operating system which was much better than Commodore’s pathetic CP/M cartridge. The C64 couldn’t even display 80 column text without an adaptor (although of course, there were type in listings which could create and display an 80 column font, but in Commodore BASIC V2 and/or 6502 Machine Code, not under CP/M) and it was very, very difficult to transfer CP/M software onto the C64, due to the incompatible disk formats, although the German “64er” magazine managed to transfer software with a serial link from some other computer, which most Commodore 64 owners wouldn’t have had access to. Unfortunately, CP/M had been pretty well abandoned by businesses by 1985, in favour of MS-DOS or IBM PC-DOS, but the Amstrad CPC664 or CPC6128 with Locomotive BASIC, the native AMSDOS, and CP/M was all a lot of people could afford. The CPC6128 became popular in Britain. We heard that in the USA, people had “larger disposable incomes”, but there wasn’t all that much evidence about this and there were some very poor people in the USA. I doubt that people in the USA receiving Food Stamps, or in notorious slum tenements were considering buying an expensive computer, although they might have bought one of the cheapest computers. There were a lot of complaints in the USA that the Apple ][ was too expensive, leading to the rise of the C64. The Texas Instruments TI99/4A also sold a lot of units at knock down prices after production had ceased, to people in the USA who otherwise couldn’t afford a computer. Jack Tramiel even planned the Commodore 16 or Commodore 116 as a cheap, sub US$100, possibly US$49 alternative to the Timex Sinclair and Texas Instruments computers, complete with a rubber calculator or chicklet type keyboard, but the engineers at Commodore expanded it into something more expensive. To prove Jack Tramiel’s original cheap computer concept, they sold like hot cakes when offered at rock bottom prices, following their discontinuation. 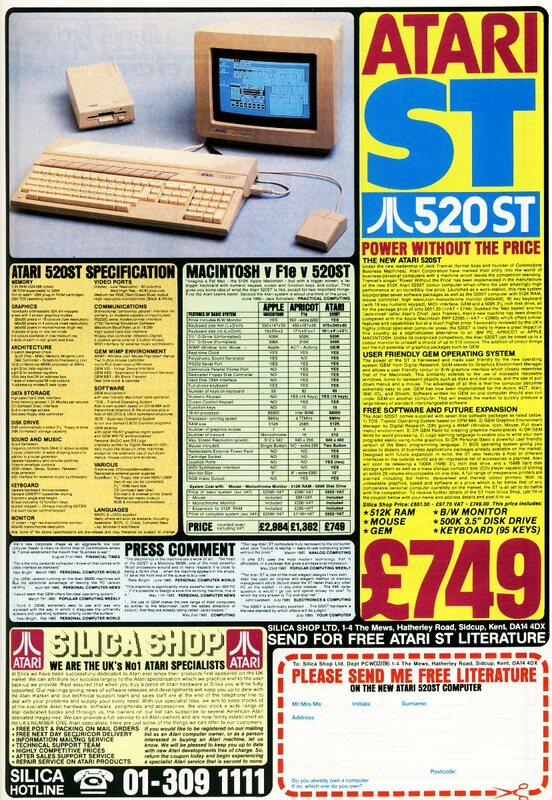 Why not buy an Atari ST for £749 instead of a CPC for £450 or £399? Of course, 1985 was also the year that the Atari ST, as well as the Amiga computer both appeared, but both computers were much more expensive than the Amstrad CPC664, which cost £450 with a colour monitor, or the Amstrad CPC6128, which cost £399 with a colour monitor, so this meant that the Amstrad CPC computers were selling to a different market of people from the ones who could afford an Amiga or an Atari ST. I should just point out that the operating system TOS on the Atari ST was basically CP/M for the 68000 CPU, controlled by the GEM interface, but of course it looked and felt nothing like the text based CP/M for the Z80 and 8086 processors. Obviously, there was no chance of my miserly Dad agreeing to pay out the extra money for an Amiga or an Atari ST, even if I’d wanted one. The Amiga was owned by Commodore, whose clutches I was escaping, while the Atari ST was designed to a spec laid down by Jack Tramiel, the Commodore 64 conman himself. Another factor in my choice of computer was not to buy a brand new model of computer, which may never have become popular. I knew that after I bought an Amstrad CPC664, I would become part of a large group of Amstrad CPC users, based on the sales of the earlier CPC464, which I read had already captured 16% of the market in Britain, unlike the Camputers Lynx, Memotech MTX computers, the Oric 1/Atmos, or the Colour Genie. 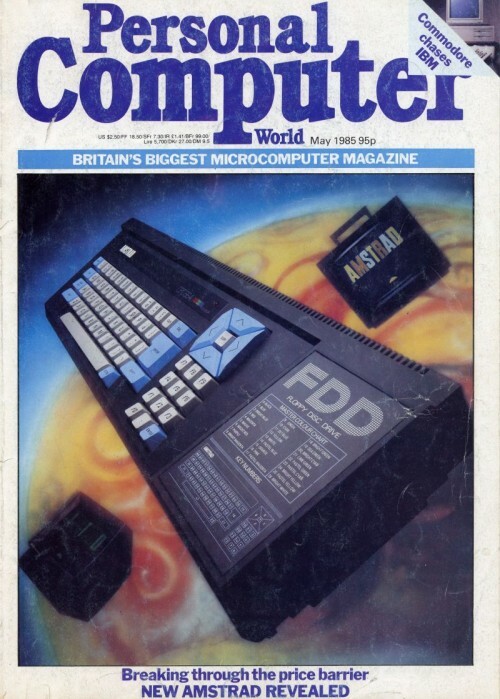 This meant that even if the CPC664 didn’t become popular, then it would still be supported by Amstrad CPC peripherals, magazines, books, and software. After it was discontinued, I was still able to buy peripherals, magazines, books, and software compatible with my computer. Unfortunately, some of these, such as a speech synthesiser and 64K RAM upgrade made me perch my CPC664 on top of two paperback books to make them fit, because the back of the CPC464 was much higher than the CPC664. Luckily, I eventually got an extension ribbon cable which solved this problem. TMR also dared to criticise a video I posted a link to of an Amstrad CPC displaying web pages as text only. This was done in a program only a few lines long. His excuse for this is that the program used OUT commands, which he claims are similar to PEEK and POKE on the C64. During my time as an Amstrad CPC664 user, I hardly ever typed any OUT commands, so this means these commands weren’t often necessary, although PEEK and POKE commands were required to use graphics, and sound on the Commodore 64. The only time I remember typing any OUT commands was in a magazine type in listing to produce some amazing interference or effects on the 6845 video chip. Of course, another reason why not many books were written about the Amstrad CPC is that Commodore 64 owners needed people writing lots of books to explain how to do simple things, such as drawing graphics, or playing a little tune, but the Amstrad CPC had commands such as DRAW, PLOT, SOUND, ENT and ENV to do those things. That’s all for now! In the next few days you can expect finally to read the next post in the series “Oh, That Would Be VERY Difficult!”, about detecting and reacting to sprite collisions, on the amazing MSX computers with advanced BASIC, complete with pics I’ve already taken of the program listing and a video taken on my new phone! This blog has no means of funding, I’m actually quite skint or broke, and my life is in danger from eviction by a property speculator, probably taking place in January 2016. If you’d like to make a donation, please send me an email on paul.londoner@gmail.com , then I’ll tell you how to do that. In his recent post on the blog “C64 Crap Debunk” called “Release Notes – Clone Invasion” which you can read on https://c64crapdebunk.wordpress.com/2015/09/24/release-notes-clone-invasion/ , TMR has done again exactly what I wanted him to by offering even more revelations about how some people were able to program the C64, although it had a totally crappy BASIC and not very detailed documentation from Commodore. Of course, the C64 is a crap computer, if only due to the fact that it was made without any attempt to include a version of BASIC which supported its hardware, meaning those all important colour graphics, and the 3 channel synthesiser chip. I think this is why most people bought it, otherwise they could have got a Commodore PET, or some other computer instead. Before it came out, Commodore had already written a better BASIC built in to the VIC-20 Super Expander, which could have been adapted and built into the Commodore 64 before it went on sale about 7 months after the CES. This later appeared as an optional extra called the “Super Expander 64”. This was the foundation of the BASIC which became BASIC 3.5 on the Commodore 16 and Commodore Plus/4. Actually, almost all the official Commodore documentation was written in the extremely crappy Commodore BASIC V2, leading people like me to believe that’s how they should program it. Examples were even given about how the VIC-II and SID chips’ registers could be programmed in Commodore BASIC V2, using sequences such as POKE (location),PEEK(same location) AND/OR number, but no real explanation about what was happening or how it worked was offered. I wondered to myself what was the point of a POKE to a location of a PEEK from the same location, because I didn’t realise that the PEEK was from RAM, but the POKE was to a custom graphics or sound chip, so not the same location at all. I had no real idea reading this crap what the effect of AND or OR would have on this either. Later on, I read about the AND, OR, EOR, and XOR logic truth tables in some amazing magazines about Z80 Machine Code for the Amstrad CPC and MSX computers. Of course, TMR has recently criticised Atari again for holding back a few details about their original Atari 400 and Atari 800 models, which were released in 1979, for two years. I think this was before many people had computers, so they weren’t affected. These details were about how to use the Player Missile Graphics, called sprites on other computers. Atari did supply the excellent Atari BASIC with these computers, which had commands for their colour, graphics, and sound, the most important aspects of computers for a lot of people. There was the option of buying an Atari 400 without the BASIC cartridge, but this could be bought separately later on and Atari BASIC was the standard BASIC for these computers, featured in most books and articles about them. It includes commands such as GRAPHICS [N] to set the display mode, SETCOLOR [N],[N],[N] to select any of the 128 or 256 colours, COLOR [N] to choose a colour from your palette, DRAWTO(N,N) to draw lines, and PLOT(N,N) to plot a point. It also has the commands STICK(N) and STRIG(N) to read the joysticks and fire buttons. This meant that Atari 400 and 800 owners had plenty of things to keep them happy during the maximum of two years that the first buyers had to wait while Atari kept the information about how to use the Player Missile Graphics to themselves. Meanwhile, Commodore VIC-20 owners were having to read about a lot of PEEK and POKE commands, while the Commodore 64 hadn’t even been released at that time. TMR has recently confessed to first of all reading a book about 6502 Assembly Language, but which wasn’t specific to the Commodore 64. This must have made things more difficult, not including information such as where the screen RAM is located, or any details of a routine to print out a character. This information was included in the book “Machine Language for the Commodore 64 and other Commodore Computers” by Jim Butterfield. It was also included in Commodore’s own “Commodore 64 Programmers’ Reference Guide”, which contained hardly any information about Machine Code/Assembly Language. When I owned a C64, I only heard of Jim Butterfield briefly as the author of an article on garbage collection in Commodore BASIC V2. Obviously, Commodore, as well as all magazines about the C64 should have been screaming his name as their saviour who told people how to start programming the C64, although the official Commodore books failed miserably at this. TMR has refused to supply a flowchart for “Clone Invasion”, but has supplied all the source code. This runs to 861 lines or perhaps only 687 “SLOC”, meaning minus the blank lines and comment lines! From that, we can safely say that this isn’t an example of how someone could get started writing demos on the C64. It would require a lot of study and creating some much simpler programs before getting on to this. You can always consult TMR’s nine part series “The Hex Files”, but this ends on a cliff hanger, although he said there were more articles which he seems to have lost. I think these would be available through a request to The British Library, which seems to have an archive of all magazines and newspapers published in Britain. To sum up, I was practically in tears over trying to remember lots of five digit memory locations to PEEK and POKE with numbers from 0 to 255, as well as very annoyed to find out that this wasn’t necessary on any other computers except the Commodore VIC-20. No one told me I should ignore what the official Commodore books said, more or less forget about BASIC and get into Machine Code which would have given me the advantages of not only more easy to remember hexadecimal numbers, but reusing previously typed equates files giving these locations actual names. That’s all for now. Some more debunks, as well as the continuation of the series “Oh That Would Be VERY Difficult!”, about the building blocks of writing a game in MSX BASIC, will appear here in the very near future.